Blue Springs Siding and Windows is proud to be the Top Rated Local® window, siding, door, and roofing company in Liberty and the surrounding areas. Whether you need a roof replacement or a window and door installation, our team is here to get the job done correctly at a price you can afford. We couldn’t be prouder of our A+ rating with the Better Business Bureau, and our customer reviews certainly speak for themselves. We offer a lifetime guarantee on all of our products and services, providing you with the peace of mind you need to invest in your home. You can view all of our products in our showroom located in Blue Springs at 2201 NW Jefferson Street, or you can get in touch with a member of our staff at 816-629-6270 . Continue reading below to learn more about our home improvement services in Liberty! Which Window Installation Is Right for Your Home? At Blue Springs Siding and Windows, we take our windows seriously. As a Top Rated Local® window company, we’re committed to providing our customers with nothing but the best. When it comes to selecting replacement windows, there’s certainly no shortage of options from which to choose. Perhaps you would like something simple and energy efficient, or maybe you’re looking for a picture window installation to completely revamp the atmosphere of your favorite room. No matter what kind of window you’re looking for, our window contractors are here to help you find the perfect product for your home. Read on to learn about window installations in Liberty! Sometimes referred to as “crank windows,” casement windows are vertically hinged and swing outward, making them a great choice for difficult-to-reach areas in the home. Kitchens, laundry rooms, and even living and family rooms are great locations for a casement window installation, as they’re all areas of the home that can benefit from improved airflow. Due to their outward swing, casement windows are unique in the ability to catch and draw in the air from the outdoors. The right window installation can really tie a room together, and if you’re looking for a way to create a bold and beautiful space, then a picture window installation is exactly what you need. What are picture windows? 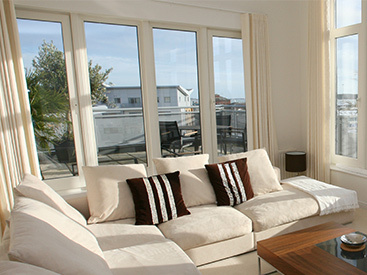 Put simply, a picture window is a large, single pane of glass that horizontally frames a space outside the home. Perhaps your home backs up to a gorgeous greenbelt, or maybe you’ve been working on a truly spectacular garden that frames your entire back patio. No matter where your home is located, you can rest assured that a picture window will completely capture and enhance the beauty of the space it frames. Liberty certainly has no shortage of beautiful areas, so you may want to invest in picture window installations throughout your entire home! While casement windows and picture windows are certainly beautiful, you may be looking for a window installation that allows the other elements of your home to shine. Double-hung windows are ubiquitous throughout the United States, and their affordability and functionality makes them a fantastic choice for homeowners who are looking for a simple-yet-effective window installation. Double-hung windows open from the upper or lower sashes, and the panes can be tilted inward whenever you need to clean them. At Blue Springs Siding and Windows, we proudly carry a variety of hardware and sash options that allow you to create a truly one-of-a-kind window installation. We even offer radius tops, which are half-moon windows that are placed above double-hung windows. If you’re looking for a way to make your replacement windows just a bit more interesting, then a radius top might be exactly what you need. Come by our window showroom in Blue Springs to see what a radius top would look like with your new windows! Just like picture windows, bow and bay windows are an excellent way to create an interesting focal point in your home. Unlike picture windows, however, bow and bay windows can be opened. While there are many differences between bow and bay windows, the main difference between these replacement windows is the number of panes used in the installation. Bay windows use at least four panes of glass to create a curved effect, while bay windows use at least three panes. Bay windows are joined at sharper angles, making them perfect for reading nooks or conversation areas. Are you ready to get started with a window installation in Liberty? Choose Us for Your Next Siding Installation in Liberty! If you’re investing in new siding for your home, then you need to choose siding contractors that can get the job done quickly and correctly. Our roofing and siding contractors are thoroughly experienced and knowledgeable about siding, and we’ll work tirelessly to ensure that you’re happy with the final result. We have a number of siding installation options from which to choose, read on to learn more! Fire Protection: James Hardie siding is fireproof and noncombustible, providing your home with an extra layer of protection. Pest Protection: Termites, woodpeckers, ants, squirrels, and other pests are something no homeowner wants to deal with. Hiring a pest control company is both expensive and life-disrupting, and paying to repair the damage caused by pests creates even more of a financial burden for your family. James Hardie siding is manufactured to be termite- and pest-resistant — you’ll never have to worry about pests damaging your siding again! Moisture Protection: If you’ve ever had to invest in a siding replacement because of moisture damage, then you’re probably looking for a home siding option that won’t allow that to happen again. James Hardie siding is designed with this need in mind, preventing water from rotting, warping, and leaking into your home. Weather Protection: The Midwest sees a variety of extreme weather conditions. From high-speed winds to hail and blizzards, there’s no shortage of opportunities for your home to be battered by the elements throughout the year. You need strong home siding that can stand up to the elements, and that’s exactly what a James Hardie siding installation delivers. Age Protection: Nobody likes dilapidated and faded siding. Many home siding options will fade as they age, but the paint utilized by James Hardie will retain its hue and saturation for years. All it takes is a simple wash once or twice a year to keep your siding looking like it was just installed! At Blue Springs Siding and Windows, we know that you’re looking for the best siding options available. 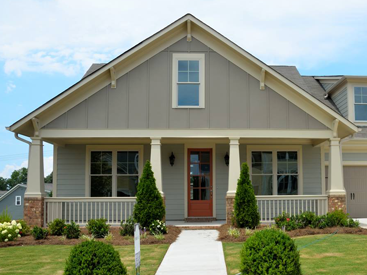 If James Hardie siding isn’t quite what you’re looking for, then a vinyl siding installation is the next best option. As a siding company with more than 15 years in the industry, we know the difference between high-quality siding and siding that will need to be replaced shortly after the installation. Vinyl siding is the top siding option in today’s market, and it’s not hard to understand why. Unlike other home siding options, vinyl siding has what it takes to stand up to the harsh and diverse weather in the Midwest. We proudly offer Prodigy by Alside to our customers because of the brand’s unrelenting commitment to quality. With a thickness of up to 1.5-inches, Prodigy is the thickest foam on the market. This siding option will help you increase your home’s insulation and reduce your energy bills. Moreover, many of our customers report a significant reduction in the noise around their property after our siding contractors have finished the installation. If you live near a busy street or have noisy neighbors, then you should strongly consider investing in our vinyl siding. Whether you’re looking for an entire siding replacement or you simply need new trim for your home, we guarantee that you won’t be disappointed by our siding. Are you ready to learn more about siding installations in Liberty? Get in touch with one of our talented siding contractors to learn more! Bring the Outdoors in With a Sunroom Installation! If you’re like most homeowners, then you’ve probably encountered an uncomfortable tension when trying to enjoy your backyard patio. As we mentioned in the previous sections, the Liberty weather is known for being intense and dynamic, and this can force you to be stuck indoors. When you can go outside, you might find yourself distracted by bugs, noises, and the temperature. Luckily, a sunroom installation provides the perfect solution! At Blue Springs Siding and Windows, we proudly use materials from Crown Windows & Sunrooms in all of our sunroom installations. Unlike other sunroom manufacturers, Crown Windows & Sunrooms has created an innovative wood and vinyl composite that allows you to fully customize your new sunroom — in fact, Crown Windows & Sunrooms is the only wood and vinyl sunroom supplier in the United States! These sunrooms are as beautiful as they are functional, they provide you with two primary benefits. The first is that due to the versatility of the materials, your sunroom installation can be fully customized. You may be wondering if your new sunroom will match the rest of your home, and the answer is a resounding, “Yes!” We can use the same materials you’ve chosen for your home, making your new sunroom look like a natural extension of your property. Many sunrooms are essentially extra rooms with large windows, but Crown Windows & Sunrooms’ designs allow for panes of glass that extend from the ceiling to the floor. This ensures that you don’t miss a ray of sunshine when you’re enjoying your new sunroom! Everyone knows that sunrooms are beautiful, but did you know that sunrooms can also help you lower your monthly utility bills? As their name suggests, sunrooms allow sunlight to enter your home, and you’ll find that the nearby rooms are illuminated with an abundance of natural light. Many customers prefer natural sunlight to artificial light, and you’re sure to prefer the reduced bottom line on your electric bill each month! Moreover, natural sunlight has been shown to decrease depression and promote well-being, making your sunroom the perfect place to sip your morning coffee or practice yoga in the evenings. Sunrooms also add to the square footage of your home, allowing you to increase your home’s overall value and recoup your investment if you decide to sell. You’ll have a compelling edge on nearby listings when you note that you’ve invested in a sunroom installation! Our sunrooms also meet and exceed the energy-efficiency standards developed by the following agencies: Energy Star, the National Fenestration Rating Council, National Sunroom Association, and American Architectural Manufacturers Association. Like all siding, window, and door installations, our sunrooms come with a lifetime warranty on all parts and labor. We guarantee that you’ll love your new sunroom, so don’t hesitate to connect with a member of our team to request a free estimate! Improve Your Home’s Curb Appeal With a Door Installation! While many homeowners think of kitchen remodels or bathroom redesigns when they think about home improvement projects, door installations are one of the cheapest ways to improve your home’s value and curb appeal. Whether you’re looking for a simple front door replacement or a window and door installation job for your entire home, our team has the skills and the knowledge to help you create the home you’ve always wanted. We offer wood-clad, fiberglass, aluminum, and steel entry doors, and you can come to our showroom in Blue Springs to view them all! Continue reading below to learn more about door installations in Liberty! Whether you’re selling your home or staying put for the foreseeable future, it’s important to have a beautiful and functional entry door at the front of your home. Your guests and passersby will notice your front yard, windows, and decor, but your entry door is the focal point of your home’s exterior. Even if the interior of your home is stunning, a cracked, chipped, or worn-out front door will give guests the impression that you don’t give your home much care. At Blue Springs Siding and Windows, we know that your home’s aesthetic appeal and security are important, and we’ve chosen to carry exceptional front door replacements from Pro-Via that deliver the ideal combination of safety, durability, and affordability. 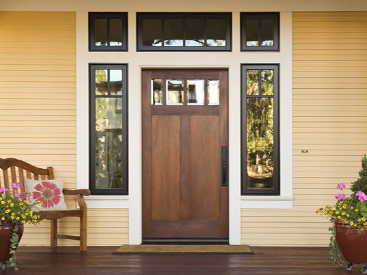 Pro-Via’s entry doors utilize AccuGrain™ technology that mimics the beauty and durability of traditional wooden doors, but eliminates the drawbacks. You’ll love never having to worry about rotting, warping, or cracking when you choose us for a front door installation! Your backyard is an extension of your home’s interior, and if you’re like most Liberty residents, then you’ve probably invested in beautiful patio furniture and decor for your home. Perhaps you frequently entertain guests, or maybe you’re the block’s go-to grillmaster when the hottest days of summer roll around. No matter how you use your backyard, it’s important that the patio door matches and adds to the beautiful space you’ve worked so hard to create. At Blue Springs Siding and Windows, we proudly provide patio door installations that can accommodate a variety of homes. Our hinged patio doors are the perfect way to simultaneously customize your interior and exterior, and you can even opt for French doors if you want a truly elegant and sophisticated space. If you don’t want to have to make room for swinging doors, then you should invest in a sliding patio door installation. Much like a picture window installation, a sliding patio door provides you with a beautiful and unobstructed view of your outdoor space, and it will also fill your home with plenty of natural sunlight throughout the day. You’ll love being able to look out onto your patio from the comfort of your own kitchen, and you may even find that you can leave many of your interior lights off during the day! If you’re investing in a front door replacement, then you need to ensure that you’re making the most of your investment. We’ve been providing Liberty and the surrounding areas with door replacements for more than a decade, and we’re no strangers to the harsh weather that can occur throughout the year. While our entry doors are the toughest on the market, adding a storm door to your home is a fantastic way to extend the life of your entry door. While a storm door will protect your entry door from the weather, it will also provide you and your family with an extra layer of protection. Perhaps you want to open your front door during the day to let the natural light in, but you don’t want your home to be unprotected. A storm door allows you to do just that, all while remaining completely secure. Moreover, storm doors act as an extra insulating layer, preventing your HVAC system from working overtime. We offer a number of storm door installation options to fit your specific circumstances, and we have customization options for everything from the glass and hardware to the grille. Transparent: Transparent glass is perfect for French doors that will be installed between shared rooms or near large windows. With perfectly clear glass, you’ll love the amount of natural light that flows between the rooms. Translucent: Translucent glass provides a bit more privacy than transparent glass, but it still allows some light to shine through. Tinted: Tinted glass is perfect for bedrooms, studies, and other areas that require a bit more privacy and less natural light. Textured: Textured glass is perfect for homeowners who want both privacy and detail in their French doors. If you’re wondering about our glass options, please come by our showroom to see them for yourself! Are you ready to outfit your home with the doors you’ve always wanted? Contact a member of Blue Springs Siding and Windows for a French door installation in Liberty! We back our doors with lifetime warranties on the labor and every component of your new door — you won’t find that kind of guarantee anywhere else in Liberty! Contact Us for the Roof Replacement Your Home Deserves! Your home’s roof provides you with shelter and insulation, and it’s easy to forget about it until it begins to cause you problems. We’ve been providing roof replacements in Lenexa and the surrounding areas for more than 15 years, and our local roofers are more than happy to help you increase your home’s value and curb appeal with a new roof. If you notice any of these issues, get in touch with the roofers from Blue Springs Siding and Windows to request an estimate! Outfit Your Home With High-Quality Gutter Guards! Your gutters affect your home in important ways, and even though gutter maintenance is probably the last thing you want to do on a beautiful weekend day, ensuring that your gutters are free of debris will protect your home from damage. As we note in an in-depth blog post, the primary purpose of your gutters is to direct rain and snowmelt away from your home. This function is impeded by leaves and other debris, and leaving blockages to sit for months on end can even lead to mold growth. Excessive amounts of water will flood your landscape, destroying your hard work and potentially damaging your home’s foundation. To put the point simply: you don’t want clogged gutters. At Blue Springs Siding and Windows, we know that you want to prevent clogged gutters without spending your free time on a ladder, so we’ve developed an innovative gutter guard system that does the work for you! Gutter Defender is our patented gutter guard system that uses surface tension to keep your gutters free of debris. Even during torrential downpours, you’ll find that Gutter Defender channels water into your gutters while directing pine needles, leaves, and other debris away from your home. Maintaining your gutters has never been easier! We offer zero-interest installment loans, revolving lines of credit, and other financing options that can help you purchase the products and services you need. To learn more about how you can finance your next home improvement project, please get in touch with a member of our staff at 816-629-6270 , or use the short online contact form below to reach out to us via email. We look forward to speaking with you soon!